The new name enables the inclusion of survivors from other forms of violence – e.g. family domestic, physical violence, addiction…so more inclusive going forward. We welcome the Canterbury Men’s Centre as a new MSA member organisation. On May 1, 2018, Male Survivors of Sexual Abuse Trust Canterbury (MSSAT Canterbury) merged with the Canterbury Men’s Centre (CMC). This merger marks an important milestone in the ongoing development of support services for Canterbury male survivors. CMC, which offers an expanded range of male support services, will continue to offer a specialist peer-support service for male survivors in Canterbury. Paul Dempsey and Paul Davenport, who transferred from MSSAT Canterbury, will continue to support the male survivor community, operating as Male Survivors Canterbury. However, this merger also marks the end of an era as the founding organisation for the support of male survivors in New Zealand, MSSAT Canterbury, closes down. For Ken Clearwater, who was the manager of MSSAT Canterbury and will continue on with MSA as the National Advocate for male survivors in NZ, this is merger represents both a proud and a sad moment in time. He can reflect with pride on his 20-year contribution to MSSAT Canterbury and his integral part in the formation and development of the national organisation. Ken can also take comfort in the fact that the CMC merger will strengthen local support for male survivors and will also release him to concentrate on his advocacy role, which has been his increasing focus in recent years. A special thank you to Ken and the Trustees of MSSAT Canterbury (past and present) for their outstanding contribution to the male survivor community over many years and for enabling and supporting this merger. And thanks also to Donald Pettit, the manager of CMC, and his Board for making the merger possible. We continue to explore opportunities to expand the support for male survivors in the greater Wellington region. We are currently in discussion with a number of organisations and will report our progress in due course. Participants in our international conference in November 2017 passed a resolution calling for the widening of the New Zealand government’s public enquiry into abuse of children in state care. The resolution urged the Government to include all organisations and in particular faith-based institutions where, based on the finding of the Australian Royal Commission, more than 60% of the abuse took place. At this time, we are still awaiting finalisation of the enquiry’s Terms of Reference. However, based on recent events we are not hopeful that the government will agree to expand the scope of the enquiry. MSA is currently in conversation with other organisations regarding what action we may be able to take in support of male survivors who are excluded from the enquiry. We will keep you posted. The implementation of MSA’s national qualifications curriculum took another step forward when the Board adopted the ‘Intentional Peer Support (IPS)’ methodology as the basis for our core peer-support training. IPS is an internationally accepted peer-support methodology with locally available core and advanced training and a simplified competency framework, including a self-assessment module. IPS also provides train-the-trainer programmes, which will enable MSA to facilitate their own core training in due course. 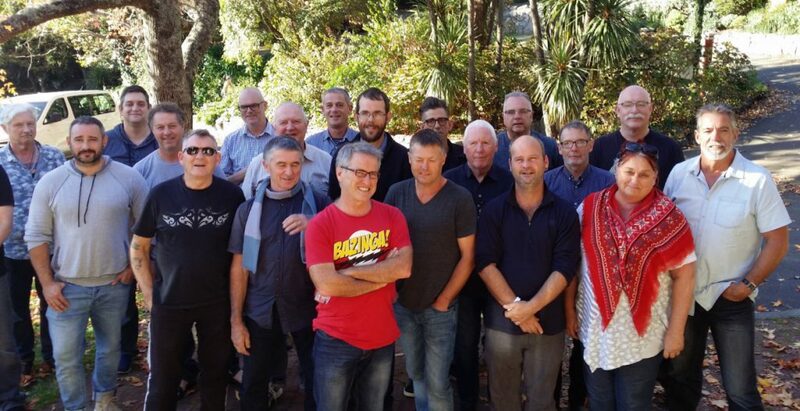 In April, 20 men, representing MSA Trustees and MSA member organisations from Auckland, Waikato, Nelson, Canterbury and Otago, participated in our first national IPS residential training programme in Nelson. All participants were appreciative of the excellent facilitation by Suzy Stevens and David Hegarty from IPS Aotearoa NZ, and enthusiastic about the potential for IPS to become the national approach to peer-support. Not only was this an outstanding training experience, it was also an invaluable opportunity for MSA people to spend peer-time together building relationships for the future. MSA plan to support another core training programme in 2019 and are assessing options for hosting advanced training and qualifying our own trainers through the train-the trainer programme. We are also awaiting with interest to review the new peer-support-group facilitator training to be rolled out by Better Blokes Auckland. Our appreciation to Dave Passell and Auckland the team for their work in developing and trialling this new training. We have continued our work with the Safer Families team from MSD to co-develop a peer- support services model that will meet government requirements for ongoing funding. I am pleased to report that we have now agreed a draft set of Service Guidelines that will be implemented as part of the F2019 government funding programme. A special thanks to Rick Manley and Gordon McKenzie of MSD for their ongoing support in developing these guidelines. I am also pleased to report that MSA member organisations have received a 15% increase in funding for F2019 though that funding, which is not yet assured for F2020 and beyond, is still based on a bulk allocation (fixed funding) model rather than our preferred fee-for- service (variable demand funding) model. The co-design with MSD of the Service Guidelines, and their adoption for F2019, is hopefully a positive step forward in achieving a longer-term, sustainable and demand driven funding model. It is important to acknowledge that the draft Service Guidelines, which will apply to any organisation funded to provide peer-support for male survivors, are based largely on MSA policies and embrace intentional peer-support as the core peer-support model. A general report on service development and improvement ideas and initiatives. The service experience report will require periodic (suggested minimum six-monthly) feedback from survivors who will asked to rate their experience of the support received. The Service Guidelines also reference an MSA Good Practice Guidelines for peer support, which is currently under development – refer comments on Peer Support Guidelines below. Organisational Quality Standards – a set of standards for organisations providing support services for males (as distinct from females) with a specific focus on support services for male survivors…informed by the work of the Male Survivors Partnership UK. Once endorsed by the MSA Trustees, these guidelines will be published as a shared resource for all organisations aspiring to provide effective peer-support for male survivors. A special thanks to Tony Chamberlain for developing these draft guidelines. The release of these standards in 2019 (see above) will create an opportunity for MSA and its member organisations to increase institutional and government awareness of the need for male-specific service for male survivors. The intention is to advocate these standards as the qualifying national standard for all New Zealand service providers who offer support services to men who have experienced trauma in their lives, including but not exclusively, survivors of sexual abuse. The vision of Toah-Nnest – Te Ohaakii a Hine, National Network Ending Sexual Violence Together – is for Aotearoa New Zealand to be free of sexual violence. I am pleased to report that Mike Holloway, manager of Male Support Services Waikato, has been elected as MSA’s representative to the Tau Iwi Caucus of Toah-Nnest. Mike succeeds Ken Clearwater to continue MSA’s participation with this national organisation. I am pleased to advise that Ken Clearwater has been appointed to provide a male-survivor voice within the Accident Compensation Corporation’s Customer Advisory Council. We continue to develop national policies, which are intended to guide the governance and operations of our Member Organisations towards serving the best interests of the male survivor community. We have taken a view that these policies should be freely available to any organisations that share our purpose of ‘enabling the wellbeing of male survivors’. The current set of policies can be viewed on our National website. Those of you who visit our national website (https://malesurvivor.nz/) will have noticed a new ‘pop-up’ on the home page that presents the new national helpline – Safe to Talk ( He pai kit e korero). This new 24-hour service for people affected by sexual harm will provide an on-call service for male survivors to access support by phone, online chat, email or text. The service providers have the contact details for MSA member organisations which are also tagged on the pop-up. Subscribers to the national website will now receive monthly update emails that refer them to recent news-posts on the site. Developing a new long term sustainable funding model for peer-support services.